Well here's something a little different. North Carolina resident Scott Mosher plays a brand of heavy progressive rock that combines several easy to describe styles into something that's a little difficult to describe. I'll quote the blurb from his web site: "Virtuality merges the worlds of trance, ambient, new-age and metal forged in the fires of atmospheric neo-progressive song structures". It's difficult to call the music either neo-prog or prog-metal, though these are the worlds it essentially resides in. But what Mosher has done is take heavy Rush influences (with a dash of Dream Theater) and inject a heavier keyboard presence that is sometimes symphonic and sometimes recalls the spaciness of Tangerine Dream or robotic synth patterns of Kraftwerk. It's an interesting combination of influences that gives a welcome edge and variety to a form of progressive rock that doesn't often establish an identity of it's own. With the exception of brief guest vocals and guitar, Mosher plays all guitars, keyboards, and vocals, and did all the dark futuristic art in the liner notes. Among the highlights is the title track which features heavy Rush influences, though the keyboards are as prominent as the guitar giving a full orchestral heavy rock feel. "The Human Machine" opens with a syncopated keyboard pattern and other Kraftwerkian synth textures. But the percussion buildup indicates that heavy rock is imminent, and sure enough, the music blasts off into full symphonic metal. It's great to hear blasting guitars married with lush keyboards, and the additional synth work takes the music to a level beyond simple prog-metal that makes it much more interesting for this listener. "The Dreaming Eye" is a similar track, but more space symphonic than metallic. I really like the thematic shifts between heavy rock and spacey keyboard patterns. Dreamy moments quickly accelerate and absolutely ripping guitar bits blaze over trancey synth patterns. "A Season Of Fire" is another strong track with searing keyboards that add a welcome cosmic element to this progressive instrumental. Really nice guitar work along with Tangerine Dreamy keyboards. "Attillon Sunrise" and ""Shores Of A Cosmic Ocean" are the most mellow tunes on the CD, being heavenly ambient pieces. "Re-Define" is the most Rush styled rocker on the disc but heavier on the keyboards. In fact, it sounds like Geddy Lee himself sitting in on vocals in both singing style and the sound of the voice. And the closing track, "Sorrow In A World Of Darkness", is a 12 minute epic in which all of Mosher's influences come together, blasting seamlessly through Rush styled progressive rock, keyboard intensive neo-prog, and ambient space. An impressive set that will appeal to a diverse audience including space and prog rockers. Hear sound files at Scott's Mp3.com web site at: http://www.mp3.com/Scott_Mosher2. Contact Scott Mosher via snail mail c/o The Ambient Mind; 1510 Quail Ridge Road; Site I; Raleigh, NC 27609. 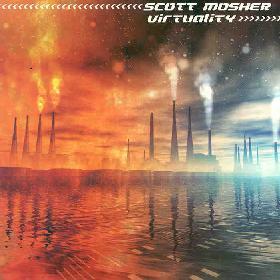 Virtuality is available for $11 directly from Scott. Overseas orders might want to email him first regarding extra postage. You can reach scott at ninja@mindspring.com.